The First Coast now has its first company dedicated to high speed refrigerant recovery. Rapid Recovery’s unique Honda powered recovery machines can be viewed as time machines that give your hard-working technicians back the time that they lose doing refrigerant recoveries themselves. Imagine all of your refrigerant recoveries being completed 10 times faster than before. Our specialty is high speed refrigerant recovery on job-sites and cylinder exchange at your facility. All services include detailed EPA documentation. Now you can leverage our high speed recovery with on-site refrigerant delivery to make your jobs easier, save time and increase profit. All of this is provided by fully trained, EPA certified technicians with all the documentation you need to remain EPA compliant. We will take care of your refrigerant recovery needs throughout Florida and South Georgia. Add to this our first in-class documentation and labeling that keeps the EPA out of your wallet and off your back. Our Field Service Technicians are EPA certified and extensively trained in high speed recovery, safety and professionalism. We serve the demolition, environmental, mechanical, HVAC and refrigeration markets. Got a Federal job with NASA or the Navy? We have you covered as we surpass their high requirements for process and documentation. 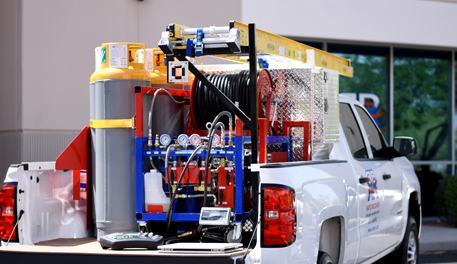 With 300 feet of recovery hose on each truck, our customers know that we are the first call for hard-to-reach units. From refrigerators to 3 ton split-systems to 50,000 ton chillers, racks and specialized units such as Leiberts, we can make your job-site life easier. Our ultimate goal is to simplify your job-site while helping you to look like a hero with your customers. Contact your local Jacksonville team today to get a quote on your next project.